An Old Master painting hung in the spare bedroom of a family home in Oxfordshire sold for a surprise £440,000 (plus 20% buyer’s premium) at Holloway’s of Banbury. A group of intriguing Old Masters being offered at Cheffins next month was the catalyst for the auction house holding its first London viewing. With the works including a rare, striking and potentially very valuable Guercino (1591-1666) dog portrait, ATG spoke to head of the Cambridge saleroom’s head of pictures Sarah Flynn about the upcoming sale. Here we ask the dealers who participated in ATG's Round Table discussion the reasons why they choose to stand at the fair and ask them to pick out a star item they are taking this year. Chiswick Auctions (25/12% buyer’s premium) has held its first dedicated Old Masters sale, capitalising on the void left by Christie’s South Kensington’s closure last year. An oil on canvas by Bartolomé Esteban Murillo (Seville, 1617-82) which has recently been examined and published by Dr Benito Navarrate Prieto, and incorporated into the body of Murillo’s work, is a highlight of the next paintings auction at Ansorena, Madrid, on March 6-8. Now billed as ‘Master’ week, as opposed to ‘Old Master’ week, the traditional winter auction series in New York posted a solid performance whatever its title. A previously unrecorded painting attributed to Giovanni Francesco Barbieri, the Italian Old Master known as il Guercino (1591-1666), has been consigned to Cambridge auction house Cheffins. A previously unrecorded painting attributed to Giovanni Francesco Barbieri, the Italian Old Master known as il Guercino (1591-1666), has been consigned to Cambridge auction house Cheffins. 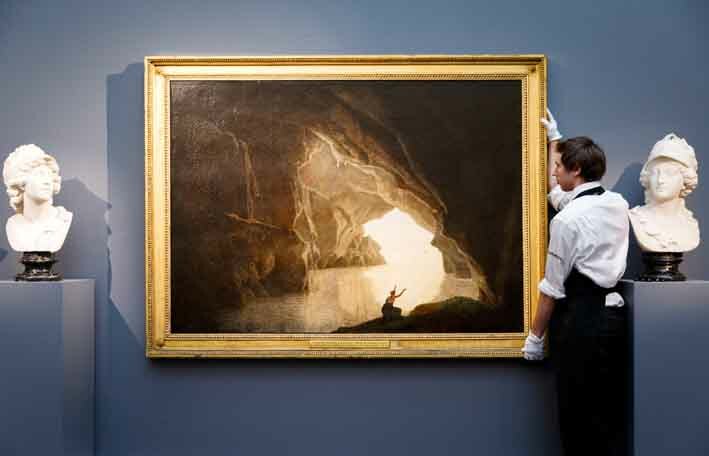 It will be offered its sale on March 7-8 with an estimate of £80,000-120,000. One of the few large-scale oil paintings by JMW Turner (1775-1851) left in private hands has been barred from export in the hope of finding a buyer in the UK. Do unfinished pictures appeal to connoisseurs? On the one hand you can argue that they show the working methods and creative process of the artist. On the other, they could be considered scraps left over by a painter or a remnant of a long-abandoned project that surely few collectors could want? Tiziano Vecellio, known as Titian, painted ‘Saint Margaret’ with the help of this workshop in around mid-1560s. It depicts Margaret of Antioch, the virgin martyr who escapes from Satan, pictured as a dragon. It is now being offered at Sotheby’s in New York on February 1 with an estimate $2-3m. An auction series devoted to Old Master paintings, drawings and works of art has long been a feature of the first month of the year in New York for Sotheby’s and Christie’s. Among the highlights of the upcoming Old Master auction series in New York is a pair of vedute by Canaletto (1697-1768) for which Sotheby’s have produced a promotional video using CGI animation. The traditional Christmas Old Master series in London provided the first test of the market since the spectacular sale of Leonardo da Vinci’s Salvator Mundi in New York three weeks before. A classic vedute by Francesco Guardi (1712-93) that sold at Christie’s in London this summer has been blocked from export. Establishing an auction record for Artemesia Gentileschi (1593-1652), a rediscovered self-portrait that sold for €1.85m (£1.63m) in Paris was described as “a museum-worthy piece and a powerful painting” by Eric Turquin, appraiser and expert in Old Master paintings. A 17th century Old Master by Artemesia Gentileschi (1593-1652) depicting St Catherine of Alexandria has set a new auction record for the artist in Paris.